Here’s a quick tip on how to create a better living space: minimize the amount of plastic in your home. There are some exceptions but in general, plastic represents dead energy and if you are surrounded by a lot of plastic, chances are you are unhappy with your space. One exception to this rule is with clear acrylic items, this durable clear material allows energy to flow through with minimal impact on the space. My other exception is with household tools that get stowed away when not in use, ie. 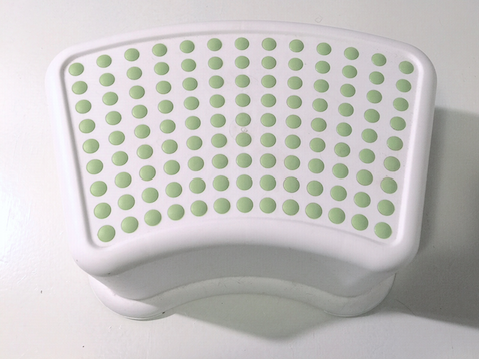 cleaning tools, this foot stool (pictured), because we still have to be practical ya know. So look around you, find any plastic item you’re unhappy with and change it up! Try swapping out that plastic cup for an inexpensive pretty mason jar or swap out that plastic electric fan for a stainless steel version instead. These small changes can make a huge impact! (And don’t forget to recycle or donate your old stuff).